My love for the wines of Maryland continues to grow exponentially. It wasn’t always like that. I used to think that all this great state was known for was super sweet and fruity wines. How wrong I was and now many local bottles have become some of my favorites. And with that I wanted to have a celebratory wine to celebrate Maryland Wine Week. 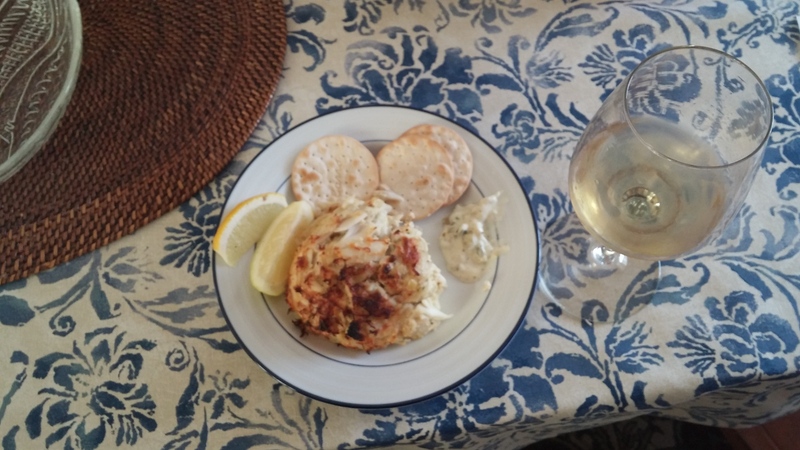 My friends suggested we do crab cakes for dinner for a variety of seasons. We were celebrating birthdays, anniversaries, and other milestones. And what a better way to honor this great week with a savory meal that does it justice. I was all set to grab a bottle at my local wine shoppe, but fortunately, circumstances led me to a wine that was right under my nose. Happenstance, fate and serendipity were on my side again. Or was it something else? The wine chilling in the fridge is from one of my favorite Maryland wineries. 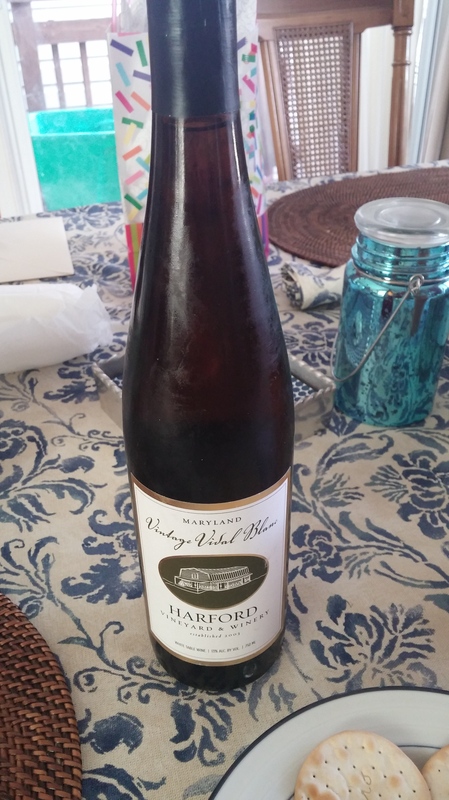 I was pleased to uncover the 2013 Vintage Vidal Blanc from Harford Winery. 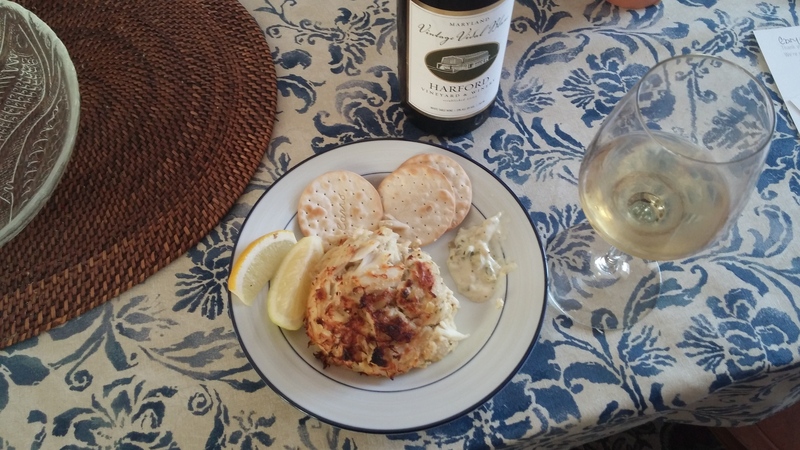 And I had researched wines that go well with crab cakes, and the fact that a Vidal Blanc is a strong suggestion and match, makes this all come together perfectly. The cakes came from right up the street from me, via Box Hill Crabcakes or Box Hill Pizzeria depending on how you look at it. I am thrilled to keep the Harford County theme going. And these are to die for. 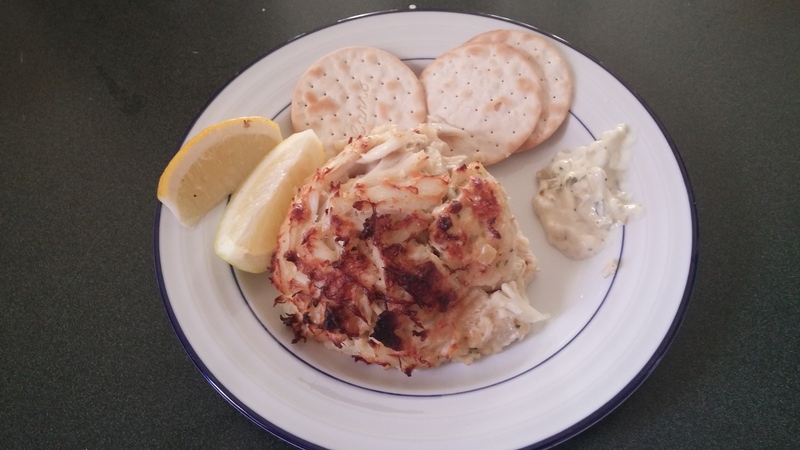 I’ve had crab cakes from many restaurants and this might be my favorite. I can’t put into words why or how. 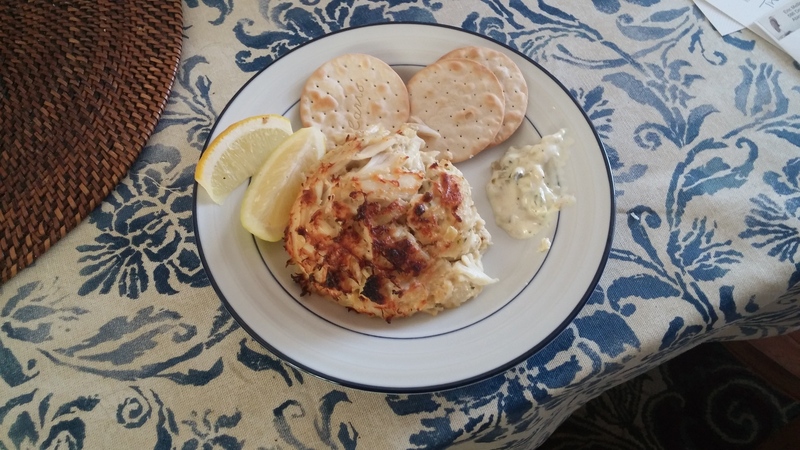 They just taste so great and look so full, like a real crab cake should. You get what you pay for and this is worth all of the $15 and then some. The photography does not do that justice. But isn’t this one of the prettiest things you’ll see all year-long? So how was the wine? I loved it. I didn’t think I would. And it’s not on the level of my current and at the time wine from them. You can read more about their Cabernet Franc here. It was my second ever post on this blog. When I first sipped it, I detected something sour. I thought maybe some golden apples or lemons. But when I researched, it mentions hints of grapefruit which makes total sense. 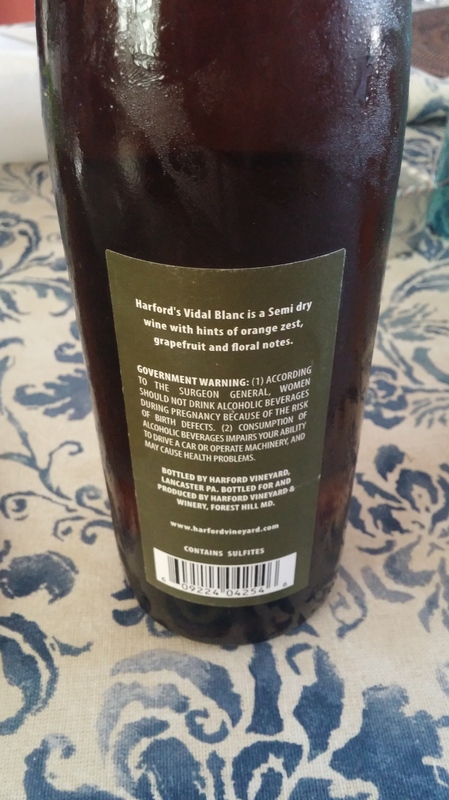 Actually I didn’t need to research after I turned the bottle around and saw what the wine contained. Whoops! When they mention orange zest I could sense the taste but only after I read about it. Otherwise I would think there were apples or hints of flowers, which is mentioned. Again, it’s all about your palate and what you’re feeling at the time. The core flavors can be detected with constant sampling but everything else is open to interpretation. There will more about this incredible winery from me in near future. 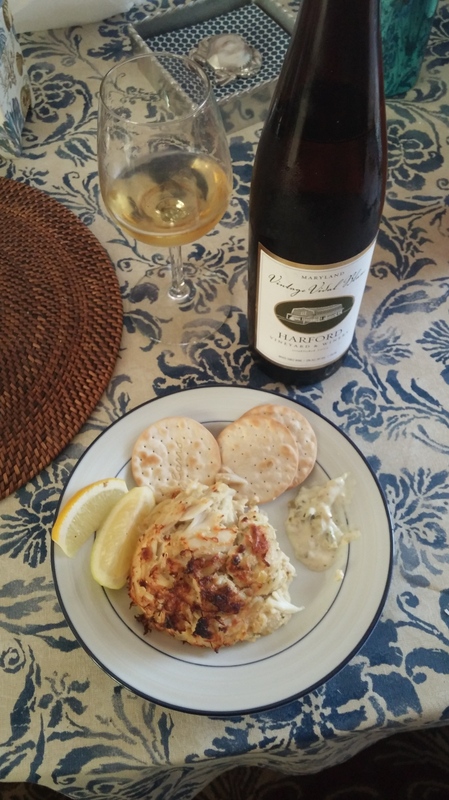 This wine is the perfect dichotomy to eating something hearty as a crab cake. And this is one of the best experiences I had having one and the wine had so much to do with that. There really seemed to be an explosion of flavors I might not have gotten before. I would usually just enjoy my meal with a glass of water or a soft drink. This is the way to enjoy it. I think the wine can be drank on its own since its fairly light. But I am so happy to have paired these two. It’s a match made in heaven. And I like to think I added my tribute to this wonderful week. More information about Maryland Wine Week and how we can be involved can be found here. And information on many of the events revolving around this special occasion can be found here. And on where to find their wines, you can follow this link.